Single domain protein with poorly structured N-terminus and a loop. Structurally variable regions were removed from NMR models for evaluation of predictions. OB-fold. 5-stranded β-barrel. 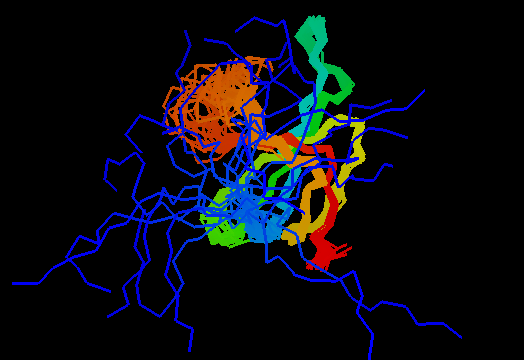 The five strands are shown in the ribbon diagram below as dark blue, cyan-green, lime-green, yellow and red. In addition to the 5-stranded OB-core, this structure is elaborated with a long insertion between β-strands 4 and 5 housing an α-helix. The two β-strands (orange-yellow and orange) in this region are extensions of the β-strands 4 and 5 and they close the barrel. All three COMPASS hit to OB-fold proteins are to the Nucleic acid - binding domain superfamily, however, alignments are wrong as they do not validate structurally. First hit is #27 in the total list of hits and its E-value is around 35, so it can hardy be called statistically significant in any case. Moreover, proteins from all SCOP classes were found by COMPASS prior to this hit. According to structure, proteins from 'Nucleic acid - binding' superfamily are also most similar to T0466. NMR models contain two C-terminal residues 109-LE-110 not present in the target sequence. Instead of these two residues, target sequence contains the following C-terminus 109-KDSSSFKAQPQAKKEPTQDK-128 apparently cloned out for structure determination. DUF961 in Pfam, which includes just a few very close homologs. Below is PROMALS3D alignment of several most distant homologs detectable by PSI-BLAST. ROSETTA failed to predict this OB-fold de-novo. Metaserver bioinfo.pl did not find similarity to other OB-fold proteins. Although some servers used OB-folds as templates, it is unclear how significant those predictions are, as quite a few all-β folds were used as templates, in particular, lipocalins, also a β-barrel fold. The bias towards lipocalin fold in ab-initio servers is likely caused by the local meander-like nature β-strand interactions in it. First models for T0466: Gaussian kernel density estimation for GDT-TS scores of the first server models, plotted at various bandwidths (=standard deviations). The GDT-TS scores are shown as a spectrum along the horizontal axis: each bar represents first server model. The bars are colored green, gray and black for top 10, bottom 25% and the rest of servers. The family of curves with varying bandwidth is shown. Bandwidth varies from 0.3 to 8.2 GDT-TS % units with a step of 0.1, which corresponds to the color ramp from magenta through blue to cyan. Thicker curves: red, yellow-framed brown and black, correspond to bandwidths 1, 2 and 4 respectively.